As a child growing up in the 1960’s, I have plenty of memories of my father wrestling with our charcoal grill in his ever-increasing obsession to grill food without charring it beyond recognition. Grilling at my house involved lots of flames and lots of smoke, liberal applications of lighter fluid and nonchalant tosses of a smoked-to-a-nub Pall Mall cigarette. Burgers were always well done, along with steak, chicken was mostly unrecognizable and usually inedible with a black coating outside and pink tinge inside. But my father swore by the use of charcoal in grilling and would never consider using a gas grill. During our visits annually to the lake, my father’s charcoal experiences were far more successful. Frankfurters no longer resemble charred and shriveled sticks, burgers were cooked to medium-rare perfection and chicken became edible. Flames still leaped in earnest from the grill but there was far less smoke. The charcoal was the cause. Isn’t all charcoal the same? Doesn’t it come from a colorful bag, stink to high heaven, is all the same size and makes your hands filthy in two seconds? Why no, no it doesn’t. The charcoal at my grandfather’s camp was kept in a burlap sack or sometimes a bushel basket. It was black but it didn’t have an odious fragrance and didn’t make one’s hands quite so black. Turns out it was wood charcoal. I didn’t understand the concept as a child but I get it now. Seems charcoal burning has been done in the hills of Rennselaer County for a couple of centuries. The foundries in Troy and other areas needed a stable fuel source that could burn at a high temperature. 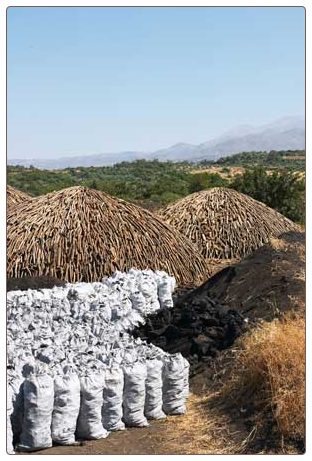 Charcoal made from wood provided that fuel and provided the mountain men with a viable source of income. Two summers ago I was able to see a charcoal pit in action and the process was explained to me. The charcoal pit isn’t really a pit. The one I saw was an area of cleared land. The pit was maintained by one person so it was relatively small as charcoal pits go. Wood is stacked in a certain manner to allow air to circulate through it as it burns. Dirt is applied to the surface of the stacked wood and the burn is maintained through the use of air holes. If the wood burns too quickly, one is left with only ash. The idea is to maintain the rate of the burn so the lump charcoal is left. 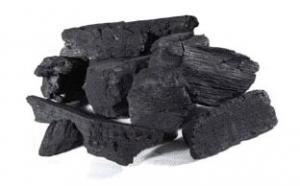 Experienced charcoal men can tell the condition of the wood by the way it sounds when they tap on the pile. The pit needs to be monitored constantly while the burn is underway. The small pit I observed burned over a ten day period, checked every two hours or so during that period. The burner adjusts the air access by filling or poking holes in the soil covering the wood. Now having used the charcoal resulting from that process I can attest to the fact that it burns better, hotter and is easier to light. Plus I know the only ingredient is wood, just good hard woods. This entry was posted in charcoal, charcoal pit, hardwoods, lump charcoal, trees. Bookmark the permalink.